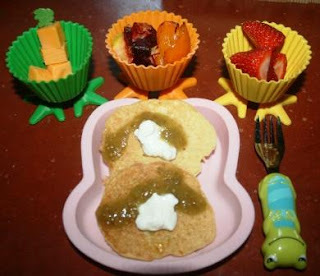 This week Pierce had a bunny skewer of cheddar cheese, a medley of roasted beets/orange bell pepper/summer squash, strawberries, and corncakes topped with sour cream and verde salsa. What a pretty meal with all those colors, huh? The recipe for corncakes was a new one, out of my June Runners World magazine. Figured I'd share the recipe, as it's easy. Also, last time I made roasted beets several people requested the recipe. All I do is just peel the beets and chop them into 1/2 inch sized cubes. Place on a cookie sheet and drizzle with balsalmic vinegar and olive oil. Sprinkle with a little freshly ground pepper and sea salt. Roast in the oven at 400* for 20 minutes, stirring once halfway. You can link up with Muffin Tin Monday for more fun kids' lunch ideas HERE. Definitely will try the corncake recipe. I love a little feta or goat cheese crumbled on my roasted beets! Thanks for sharing your beet recipe. We have tried beets from a can and they didn't go over well. We need to try them this way. I love roasted beetroot too (and no, I won't touch it out of a can either). I just wish my daughter would eat it - it amazes me that she won't, as it's sweet AND purple! Your lunch looks yummy. Another cute and nutritious meal for Pierce! And Pierce's lunch is very colorful-those strawberries look good too! The corn cakes look interesting. Will have to try them. I was up at 1:30 am LOL thinking about Muffin Tin Monday. I'm on Steroids for a short time could not sleep. Sooo I blogged. Yipieeee. hmmm i have never had corncakes. sounds interesting. Wow your kids must be really good eaters. Mine wouldn't touch the beets and peppers or the salsa verde if I had offered it to them. Great healthy lunch! Those duck feet cups are too cute! Everything looks yummy. Thanks for visiting me at B.Inspired Mama! Thanks for the recipe for the roasted beets! Now my next challenge would be to find fresh beets at the store! I've had something similar to the corn cakes but they were called corn fritters. It's been a long time since I've made them. What a cute fork Pierce has to eat with! This recipe looks really good! His plate looks awesome and now I am wanting some of what you fixed for him!! You are so darn good at this! The corncakes look delicious! I LOVE all your muffin tin ideas!! I can see that your kids eat really, really healthy! Oh! I like the cups with the feet! Really have to get me some of those!! That looks yummy! I love that each food serving has it's own little cup! I must do that for my boys sometime! Yes very pretty! I remember you giving him beets before! That's one thing I've never given my kids...and should! That recipe looks yummy! cute muffin cups too! Oooh, corn cakes! So good!